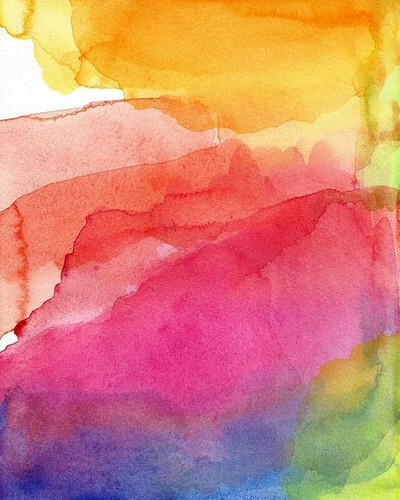 For as long as I can remember, I've admired watercolor paintings. I think they're lovely to look at no matter the time of year, but perhaps the pastel colors and washed effect pair especially well with spring and summer. 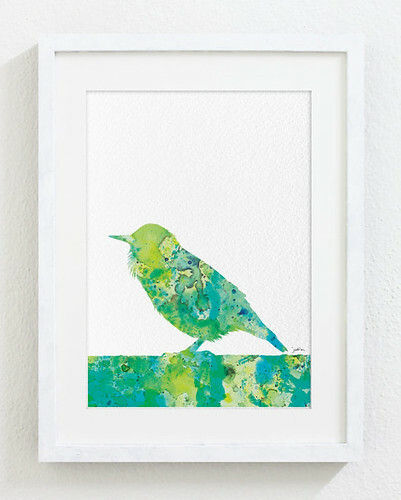 I've been scouting around for prints to freshen up our porch and had the thought to share my finds with you. 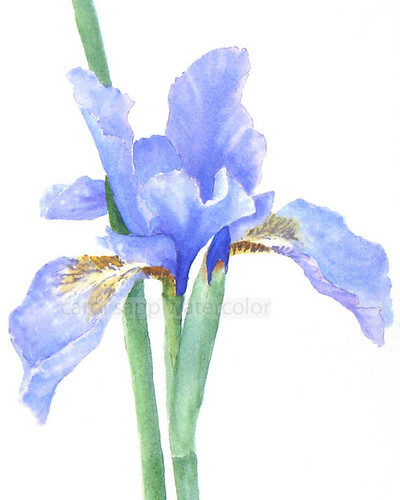 An elegant peony and lavender-blue iris are just two examples of the beautiful work by Carol Sapp in New Jersey. 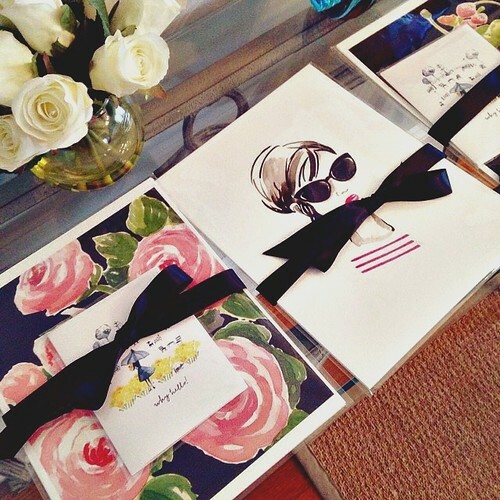 She sells them as giclee prints via Carol Sapp Watercolors. For a 10% discount in her shop use coupon code: PAPER10. Sarah Zero of Jackalope Heart [edit: shop is not stocked currently] is a designer and stationer right here in northern Delaware. 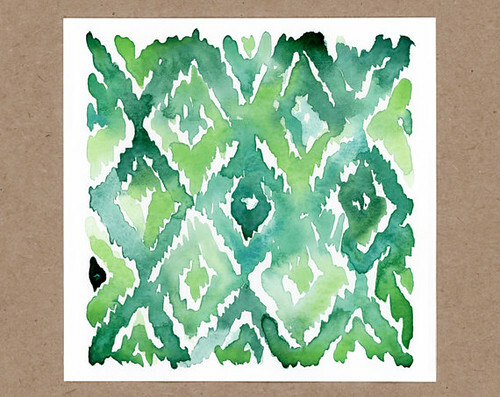 I'm drawn to the modern patterns she paints. And how cool is this? 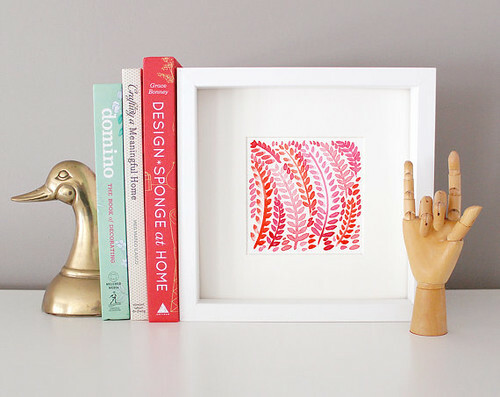 Everything in Sarah's shop is available as an immediate download - instant gratification for your desk or walls! Enter coupon code ALLTHINGSPAPER10 for 10% off your entire purchase through the month of April 2014 at Jackalope Heart. 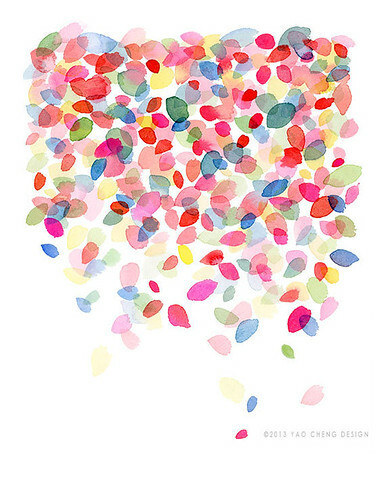 Yao Cheng Design is where I found a variety of lovely prints by artist Yao Cheng in Ohio - Flower Bouquet and Colorful Dots Falling. 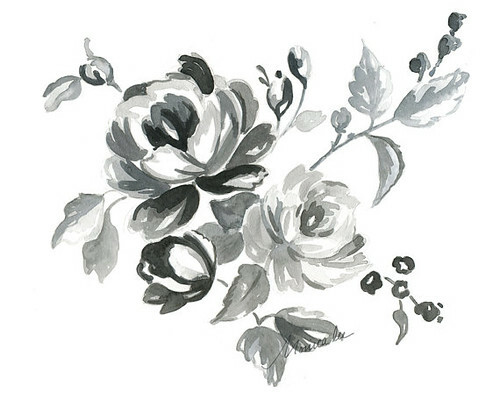 Yao also has a website and at the moment has quite a few Etsy sale prints. You might recognize Monica Lee's name as she is the host of Smart Creative Women, an inspiring web interview show that's based in her North Attleboro, Massachusetts home studio - I never miss an episode! Did you know Monica is also a professional artist and illustrator? 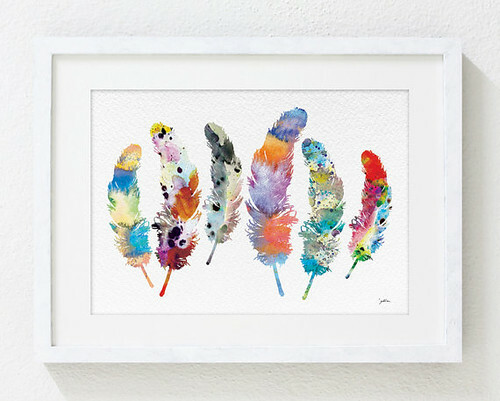 Her Etsy shop Monica Lee [edit: not currently stocked] features a cohesive collection of stylish watercolor prints and cards. Artist Julia Yap of Elf Shoppe in Kuala Lumpur, Malaysia offers archival prints of natural objects, animals, and sea life. I love the lively freshness of 6 Feathers and Blue Bird 3. 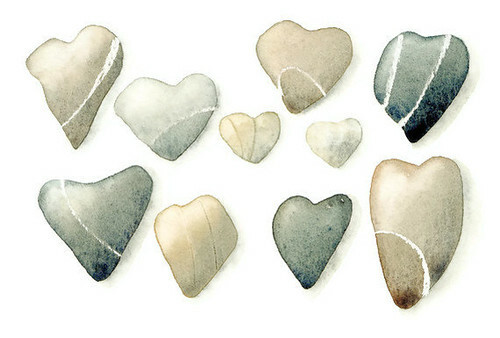 Watercolor artist and illustrator Sandra Ovono of Brittany, France enjoys searching the beach for shells, rounded pebbles, and sea glass. Each of her paintings is inspired by her passion for the beauty of nature and coastal life. 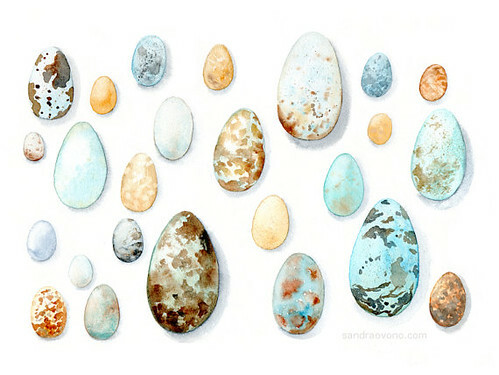 Sandra sells fine art prints of her original illustrations... these heart-shaped beach pebbles and assorted speckled bird eggs are just two examples from Sandra Ovono [edit: shop is not currently open]. For a 15% discount on all items in the shop, use coupon code "ALLTHINGSPAPER" until April 9, 2014 (midnight). 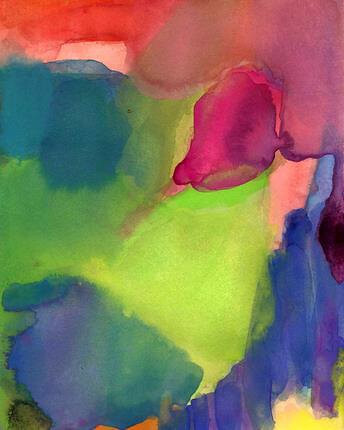 I can't imagine not being drawn to the gorgeous colors of these abstract watercolor prints by artist and Long Island, New York resident Diane of Etsy shop So Very Happy Art. Diane says her paintings are inspired "by the pure happiness found in the beauty of color and the process of creativity." I believe it... they are just brimming with joy! Do watercolors make you happy too? 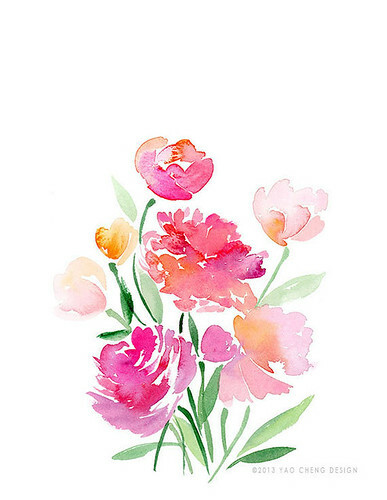 If you have a favorite watercolor artist - or maybe you're one yourself - I hope you'll share your link in a comment. Wow ! These are Awesome ! Love the post. Paper! Paint! Color! Joy! Lovely work, Heather, thanks for sharing your link. I like the way watercolors allow book page text to show through. You're very welcome, Monica. My pleasure. Very pretty...I especially like the first two and the feathers!!!! TFS!!!!! Thanks so much for featuring my shop! Lovely!! 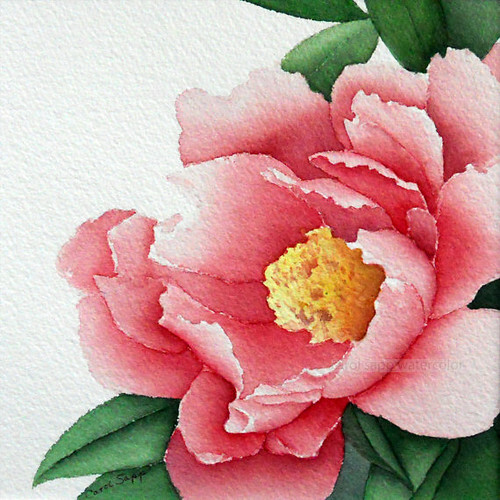 The water coloured Peony , makes me dream of watercolours again.